Robotic technology influences both spheres : the workplace and the domestic environment. Robotics has the potential to positively transform lives and work practices, increase levels of efficiency and safety, and provide improved service rate. Moreover, Robotics is set to become the core technology of a new generation of autonomous devices that, through their learning capabilities, interact seamlessly with the world around them and provide the missing link between the digital world and the physical world. 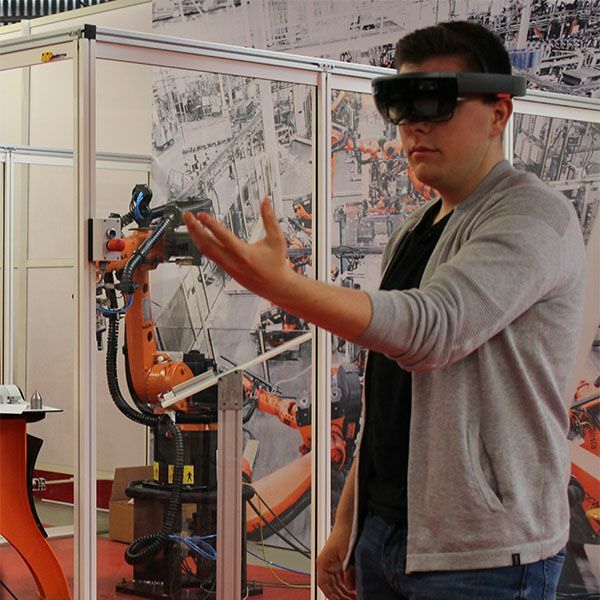 Robotics is already the main driver of competitiveness and flexibility in large-scale manufacturing industries. For more than half a century, robots have played an increasingly important role in processing industries, ranging from automobiles to electronics and going to consumer goods. Robots bring productivity, profitability and contribute to maximizing safety and performance of repetitive tasks. Robots continue to evolve, offering greater functionality, flexibility, range of motion, speed and accuracy. In addition to working in protected areas on assembly lines, robots operate more and more side by side and interact with human beings, and in some cases move materials from one place to another. For robots to operate in this ever more complex way, they must be able to process a large amount of environmental sensing data, communicate with each other, but also use centralized control units, and perform control functions to prevent harm to human beings. Your projects come alive in our technology platform with the support of our experts. The SUNI platform is a high-level technical sphere that relies on cutting-edge technical platforms and recognized experts : it gives you the advice and support necessary to integrate a robot or robots within your business in the best conditions. The integration of robots in a process requires internal and external expertise. We work together to make a diagnosis and define the project. Our added value : optimizing your production process and proposing solutions that allow the rapid amortization of the investment. We advise you for the choice of the integrator and, at your request, train your employees. 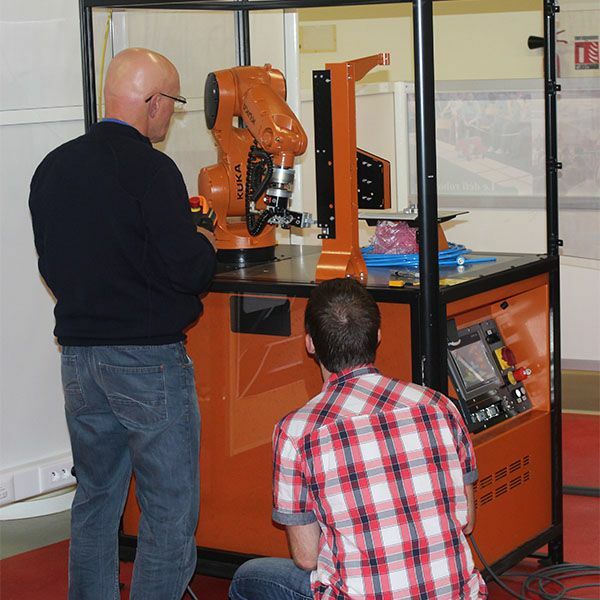 Since 2016, Kuka has been a partner on one of our technical platforms to promote formal training for Breton companies. The integration and the design of a global process were initially carried out by our teams for the company Lippi, manufacturer of gates and fences. Since then, every year, we assist companies in the design of new processes involving Robotics. For two years the technical platform has been enriched to support companies in a better way. The expert team has also expanded and 5 expert trainers are now available for you. Inter-company Robotics training courses are organized regularly at our premises. They are for anyone interested in Robotics, beginners or advanced learners. An introductory training in Robotics lasts 3 days. Our goal : to make the trainee autonomous for handling a robot. The training revolves around 5 axes : discovery of the material, overview of the possible applications of robotics, operation of the software and programming basics, construction of an application of displacement (method and strategy), security elements. The courses taught by SUNI combine theory and practical work, allowing a progressive learning curve of the material. Presentations of real applications and examples of in-house implementation complete the training. Today’s fast and flexible robots work in areas ranging from rubber and plastic processing to semiconductor manufacturing and research. They are still a mainstay of high volume production, but also find their place in SMEs. The robots involved in manufacturing nowadays are used for all types of operations, from handling raw materials to packaging finished products. They can be programmed to operate 24 hours a day, 7 days a week for continuous production. Robotic equipment is very flexible and can be customized to perform complex functions. Use of robots has increased, and as a result it is necessary to invest into robotics to stay competitive. Robotization can be very profitable for most companies, including SMEs. 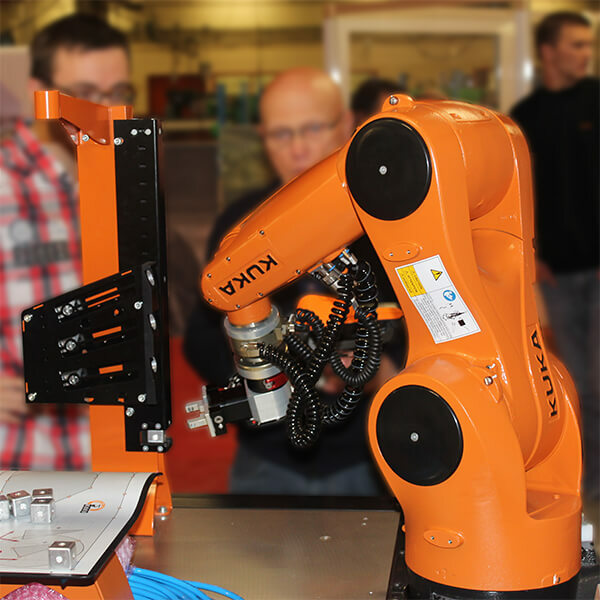 Would you like to integrate Robotics into your production line? Take the recent example of a company specializing in roof slates (hook fastening sets). The manager wanted to modernize and simplify the manufacturing process of wooden packaging crates, which was manual and complex. After a detailed analysis at the company’s request, our robotics experts designed, in collaboration with the company, a full robotic solution. 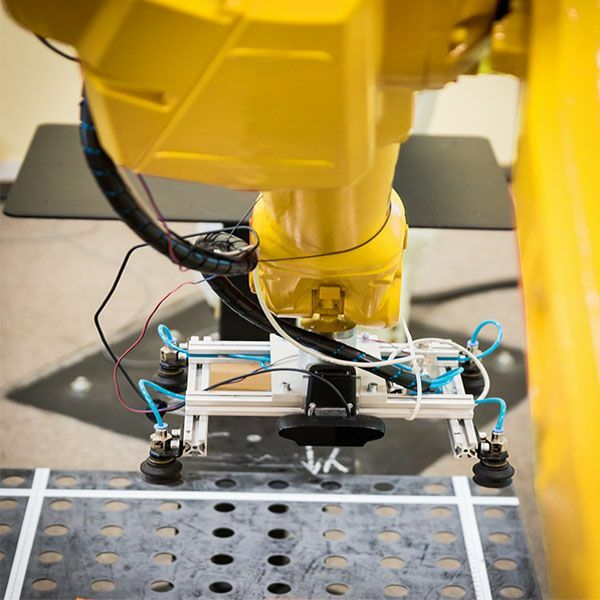 It is up to the robot to take wooden planks from a dispenser, to position them on a template, to staple them and eventually to stack them on a pallet. Before making a technical study of the project and a financial study, it is essential to be accompanied and meet staff training needs to provide the necessary skills. Then, a feasible technical solution can be transposed to the company. The implementation of the robot and the optimization criteria are taken into account, along with the training of operators and the maintenance service in order to have a fully operational production line. The main objectif is to minimize running time and therefore maximize the return on investment. In the aforementioned project, the tool changes for the placement of the pallet for stacking the boxes obliged the oversizing of the robot in order to reduce the overall cycle time. Do not hesitate to contact us for any project related to robotics training or its implementation on your production lines. We will be happy to assist you in your development in Robotics.